With the state-of-the-art water cartage units at the lowest price for it’s range. 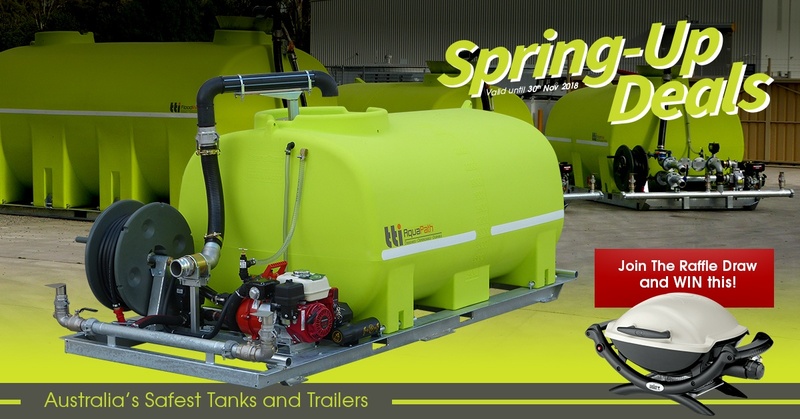 Grab this offer from Trans Tank International. Specials include water tanks, spot and field sprayers, fire fighting units and trailers, diesel refueling units and much more! Also, don’t forget to enter the raffle to win 1 of 2 Weber BBQ’s. Andrew Thompson finds the perfect unit for his Earth Moving company – FloodRite™ with Loading Legs! Andrew Thompson explains why he choose the TTi FloodRite with Loading Legs to meet all his earthmoving requirements – From Dust Suppression, Clay Compaction to Crushed Rock Placement. Check out how the magnum sprayers, pump, dribble bar, remote control & other features have made his job easier!